age range: 7 to 11 years old. I really like the idea of wordless (or almost wordless) books with beautiful pictures that "speak". 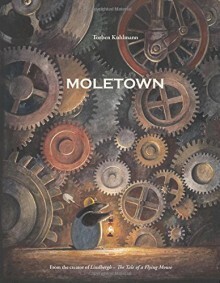 This is the story of how Moletown was first settled, how it grew and developed, and the problems that brought. But there's always people willing to find a solution, right? This was one of those books you want to start over and over again.